This section provides an introduction to BAM and also demonstrates how we can leverage BAM outside the context of process monitoring for BPEL and BPMN. BAM Dashboards can be created for many more data sets than just the analytics gathered from BPM and BPEL process execution. BAM can work with various data sources, collecting data from them into its own in-memory data structures, and allowing definition of queries and data visualizations on top of these data objects. One of the characteristics of BAM is its ability to respond in near real-time to data changes – refreshing aggregates, lists and charts without using intervention. 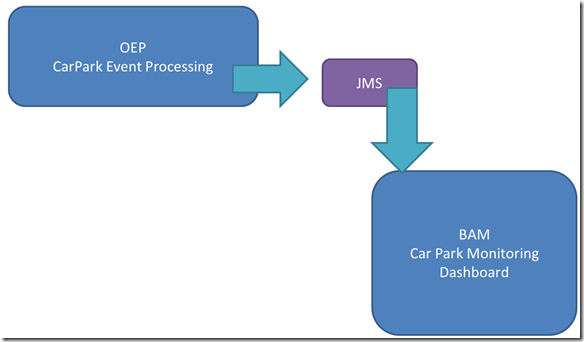 A typical source for data reported in BAM is JMS: events from the Event Delivery Network and Oracle Event Processor, Service Bus Alerts, as well as messages from custom Java applications flow through JMS to be processed by BAM. This figure visualizes the flow addressed in this section: events published to JMS from the OEP application implemented in chapter 16 are fed into BAM and published on a Custom Dashboard.. The sources for the final situation for this section are found in zip file AirportAccreditationsDashboardBAMProject.zip that contains an export from the BAM project.